As I drank coffee and read the paper this morning, I thought about where I would best position myself in the ‘hood to capture a good moment. I wasn’t sure if anyone would be outside the catholic church around the corner, but it turned out there were several folks arriving for the 11:00 a.m. Spanish-language mass. 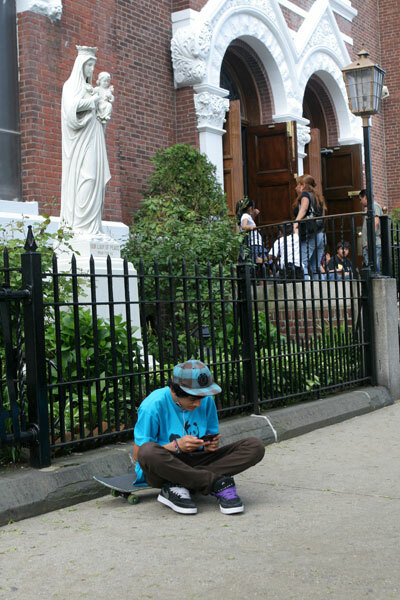 One who was there, but not going inside, was a boy in a turquoise panda shirt and an oversized gangsta derby hat, sitting on a skateboard, reading something on his cell phone. I’m looking forward to seeing what the mosaic looks like and what places in the world photographers will snap shutters and make photographs to send in.